WASHINGTON (AP) — President Donald Trump and South Korea's Moon Jae-in agreed Thursday on the importance of nuclear talks with North Korea, but the two leaders aren't completely aligned on whether sanctions will pressure Kim Jong Un to give up his nuclear weapons or drive him away from the negotiating table. 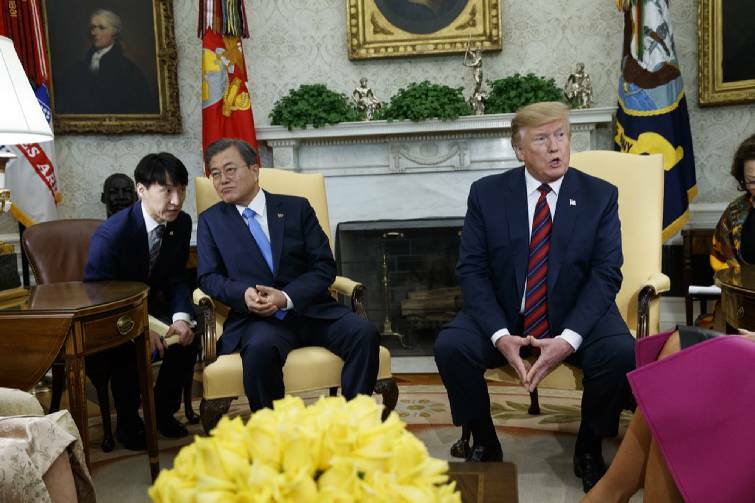 Trump, in his first meeting with Moon since the unsuccessful U.S. summit with Kim in Hanoi, said the U.S. wants to keep economic sanctions in place to pressure Kim to denuclearize. 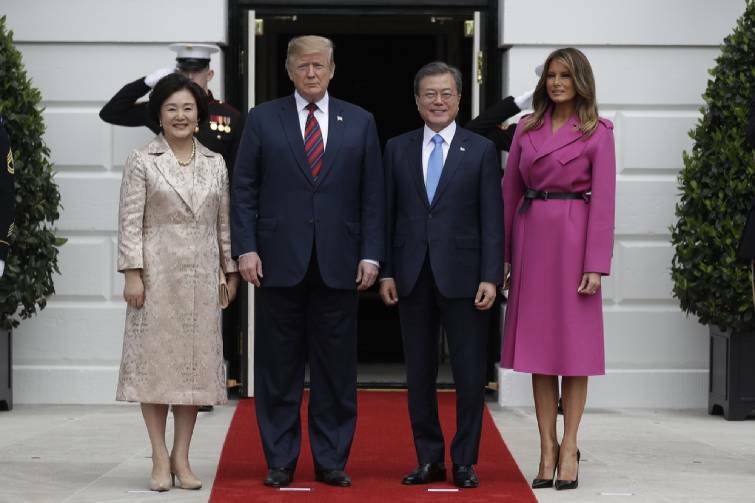 But Trump said he retains good relations with Kim and didn't rule out a third summit or taking steps to ease food or other shortages in the repressive nation. "We want sanctions to remain in place," Trump said at the White House. "I think that sanctions right now are at a level that's a fair level." 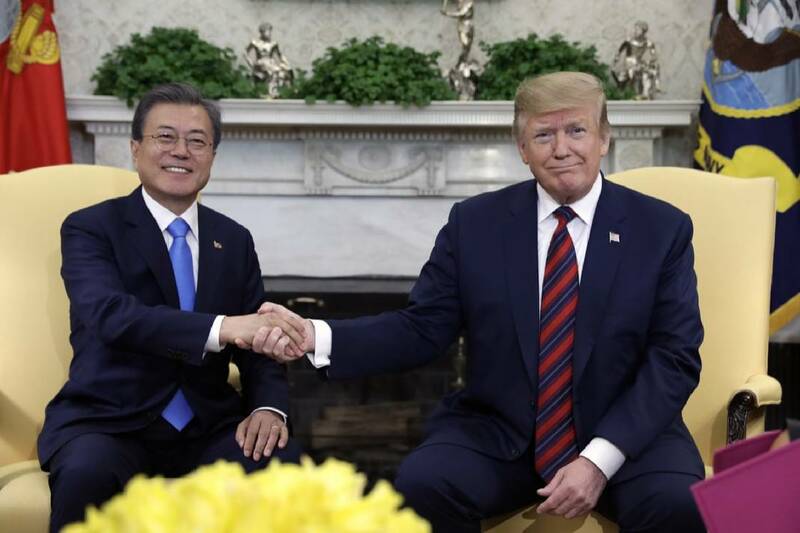 Moon, for his part, has called for an easing of sanctions, including those holding back joint economic projects between North and South Korea. But he didn't speak to the sanctions issue as he and Trump spoke with reporters at the start of their talks. Trump said he would favor easing those sanctions at the right time but added: "This isn't the right time." He said he was open to discussing smaller steps, such as helping to ease North Korea's humanitarian problems, but that, in general, the U.S. wants sanctions to remain. Moon did not directly address the issue of sanctions. But several North Korea watchers, including Sue Mi Terry, a North Korean expert at the Center for Strategic and International Studies and a former Asia analyst at the CIA, said Moon was expected to try to persuade Trump — perhaps only privately — to agree to ease some sanctions to keep the talks alive.